The property is 4-star traditional apartment building. 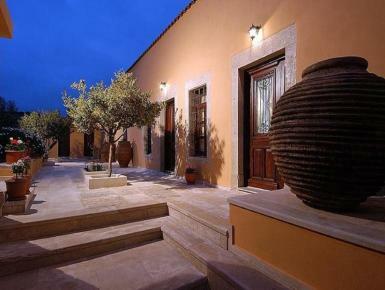 It is situated in the centre of Arhanes, a traditional town built at the foot of the sacred mount Jiouktas. Built in 1893, it is a fine example of 19th century inland Cretan architecture. It played an important role throughout the recent history of Arhanes. During the Cretan revolt against the Turkish rule, in 1897, it was used as barracks and headquarters of the Regiment of Select Cretans under the command of Ioannis Dafotis. In early 20th century it accommodated the needs of the community of Arhanes for an elementary school for several years. The house has been restored with care and respect to its original architectural elements, thus giving a new meaning to ‘traditional'. The CACG [Central Archaeological Council Of Greece has characterized it as a Protected Traditional Building.